Detoxification of alcohol, nicotine, sodium, cholesterol, heavy metals and sulphuric acid is possible during Infrared Therapy. 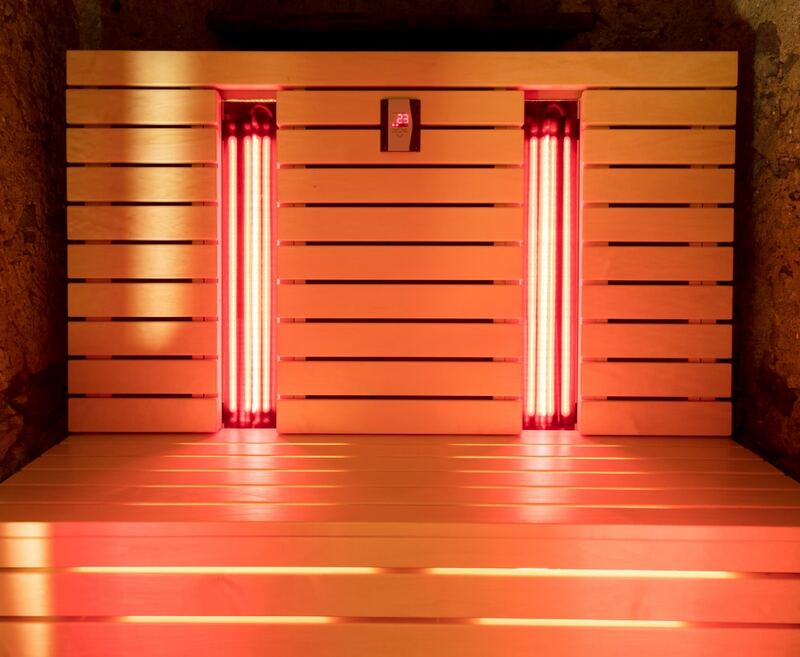 While traditional saunas treat aches and pains by heating a room to a high temperature, Far Infrared saunas are heated by metallic or ceramic elements that emit a safe amount of infrared energy, providing considerable Infrared Sauna benefits. This radiant energy heats the body, permeating between 3.5-4 cm below the skin to cleanse tissue and produce detoxification effects. Scientific evidence suggests that it is one of the most effective ways to enhance general detoxification and provide heavy metal detoxification. While the temperature of our Infrared Saunas are much lower than that of traditional saunas, and much more comfortable as a result, the Infrared Sauna benefits are more effective as they result in harmful bacteria die-off to improve immunity, aid in Pain Management, Beautify the Skin, Reduce Stress, and result in Weight Loss. We want to provide lasting health solutions to our patients, so our Infrared Sauna Therapy is also offered with varying colours – an ancient healing modality, as well as varying sounds, which are used to evoke different healing qualities. Far Infrared Therapy has been shown to be an effective fat burner, through a significant rise in the level of growth hormones within your body during treatment, that help to maintain both muscle and lean body tissue, while helping reduce body fat. A 60 minute session is able to burn up to 1,000 calories, depending on your physical condition and size. With radiant heat penetrating three times as deeply as conventional saunas, infrared therapy may be more effective at diminishing cellulite. Far Infrared Sauna benefits cover relief from Arthritis, Sprains, Neuralgia, Bursitis, Joint Stiffness, Strains, and Muscle Spasms. The deep heat of Infrared Therapy helps blood vessels dilate and in turn helps reduce Inflammation and Pain. With an increased blood circulation supporting the clearance of metabolic waste, Infrared Therapy also delivers oxygen rich blood that may help with your overall recovery process. Infrared Sauna benefits the body’s capillary network by facilitating relief from Acne, Psoriasis, Eczema, Burns, Lesions and Cuts, with the ability to clear the body’s elimination pathways. Encourages open wounds to heal faster and supports the reduction of Keloid scarring. Increases circulation to the skin to encourage beautiful, glowing and youthful skin. Firms, softens and improves skin tone. Far Infrared Sauna Therapy promotes pure relaxation, melting away stress and tension, and soothing knotted muscles and jangled nerves. The penetration of deep heat raises your body temperature and may induce an artificial fever. This strengthens your immune system to help combat colds, flus, and other bacteria. Far Infrared Therapy may assist with the clearance of toxins, through the lymphatic system, that contribute to an increased storage of body fat. Daily sweating may help detoxify and rid your body of the accumulation of potentially carcinogenic heavy metals, e.g. mercury, cadmium, nickel, lead etc. Levels of heavy metals can be monitored through our state-of-the-art instant in-house testing. Detoxification of alcohol, nicotine, sodium, cholesterol and sulphuric acid are also possible during infrared therapy.